Onesize* nappy, allowing the nappy to grow with baby from birth through to potty training, eliminating the need to buy any more nappies. The size of the nappy can be changed using the adjustable poppers and Velcro® style fastenings to suit the shape of your little one. Concealed super absorbent core and stay-dry inner layer keep moisture away from your baby's delicate skin, leaving it cool and dry. Stretchy water resistant outer fabric for even the most active babies. Unique pull out tab system makes removing the core from inside the nappy as simple as possible - this improves washing performance and speeds up drying time. 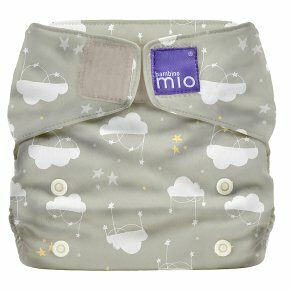 Super stay soft fabric remains soft wash after wash, providing the most comfortable nappy for your baby's bottom. Important: Please read this user guide before using and/or washing these products. Washed and/or used items cannot be refunded. Note: Bright colours may fade over time.��Caution: Flushing of liners may cause blockages. Bambino Mio accept no responsibility for individual drainage systems.